VLC 360 (VLC 3.0) is now available for download. As the new VLC 360 label indicate, the latest VLC 3.0 Technical Preview brings support for 360° video and photos. 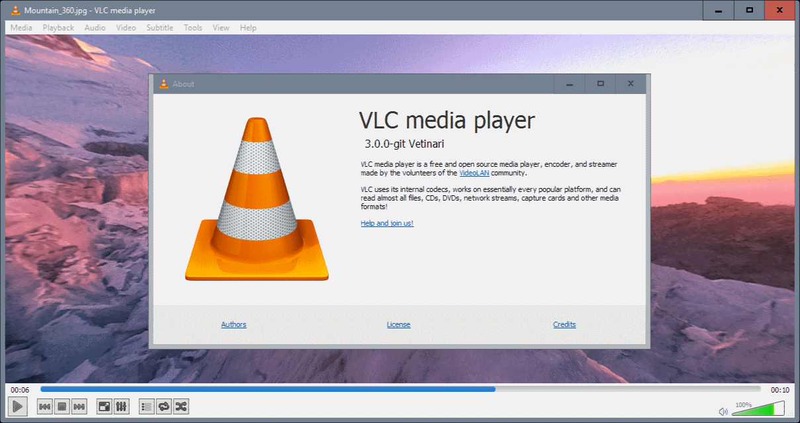 VLC is a popular cross-platform media player for Windows, Mac, Linux, and mobile devices. The new VLC 3.0 controls enable you to click-drag the mouse to look around in 360° when the video or photo playback starts. You can also use the mouse wheel to zoom in or out, or use keyboard shortcuts (Page up or down) for that instead if you prefer to use the keyboard. For other playback controls like pause, stop and volume you can access toolbar. Playback of 360 Videos following the Spatial Video spec. Playback of 360 Photos and Panoramas following the Spherical spec. Display modes with Zoom, Little planet and Reverse little planet. Control it with your Mouse and Keyboard. Open Source and Cross-platform, accelerated with OpenGL and Direct3D11. The organization will bring VLC 360 video support for other platforms including Android, iOS and Xbox One later. VideoLAN will use sensors for navigation on mobile devices. Currently, VLC 360 technical preview is available for Windows and Mac OS X only. You can download it from official website or from the link below.